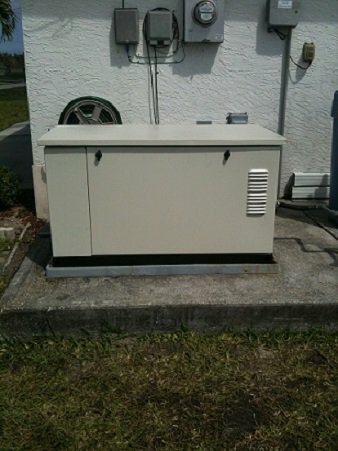 RCS Electrical Services is your best Florida generator enclosure replacement kit solution provider. We also specialize on the installation and service of the best brands of generators. We are certified by Generac, Centurion, Kohler, Briggs and Stratton, General Electric, Onan, Tradewinds, and others. Contact us now if you are in need of generator service, installation, or repair. Florida Generator Enclosure Replacement Kit To Make Your Generator Like New Again. Look At The Images Below To See An Example. This Generator Was Left To Waste Away. Owner Wanted Us To Discard It. We Asked Him To Allow Us To Restore It. We Installed A New Enclosure, Chassis, And Base. In coastal areas, where generators are exposed to humid salty air, their enclosure kit tend to wear out fast due to corrosion. Often the generator and engine are in good condition, but rust has destroyed most of the enclosure, chassis, and base. 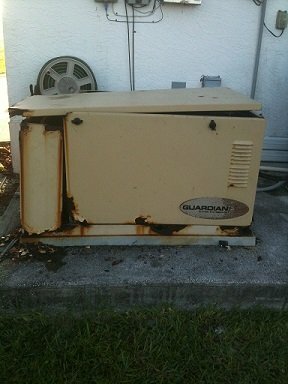 Generator companies often times push for a sale of a new generator to replace the one which enclosure has been damaged. But this solution costs many thousands of dollars. In these kinds of circumstances Florida generator enclosure replacement kit experts recommend that you replace the enclosure rather than discard the entire generator. This procedure will preserve the investment you have already made, and will allow your generator to give you a full service life. You will save thousands of dollar in hte process. 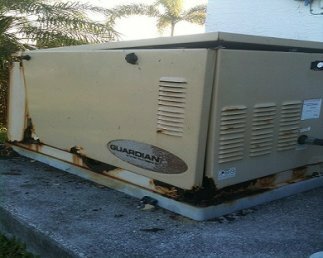 One reason Florida's generator enclosures corrode is due to Florida's salty and humid environment. These corrosive agents can be merciless when it comes to generator enclosures. Salty water condensation collects in the many crevices of generator enclosures, and before you know it, paint starts chipping. This paint damage to generator enclosures appears at first as surface rust. With the passing of time, this surface rust, will eat at the generator enclosure until it perforates the metal and creates large gaping holes in it. Another reason Generac standby generator enclosures rust is due to water spray from lawn sprinkling systems. Often times underground water is utilized by lawn sprinkling systems, which is often loaded with heavy metals and minerals. These minerals and heavy metals unleash a chemical reaction onto the surface of the standby generator enclosure, ultimately damaging it beyond repair, and cutting its service life short. One more reason generator enclosure corrode is due to battery acid sipping out of the battery case and spilling onto the generator enclosure and its metal chassis. We have special procedures to neutralize the damage created by such a events. When battery acid spills onto the generator enclosure or any of its surfaces is time to contact us. This even can definitely cut very short the service life of your generator. Contact us and we can tell you more about this. Click here to order a new standby generator enclosure kit. After your Florida generator enclosure replacement kit has been installed, maybe is time to also look at how healthy your generator electro-mechanical systems are. Even if your machine appears to be running fine, if you have not done proper maintenance, it may be needing a tune-up and other adjustments right now. If you have decided to install a new Florida generator enclosure replacement kit, it may be wise to service your unit at the same time. This way your unit will be just like new; inside and out. Advantages Of Installing A New Generac Generator Enclosure Replacement Kit. Prevents debris from entering the interior of generator. Keep animals and rodents from gaining access to generator. Improves value of your property if you intent to sell. Ways To Prevent Your Generator Enclosure Kit From Corroding. Apply a coat of wax once a year if possible. Aim water sprinklers away from generator enclosure.